A Farewell To Arms is based on Ernest Hemingway's masterpiece and was adapted beautifully to the screen. It features Cooper in one of his first major roles as the young ambulance driver serving amid the chaos of the First World War. Helen Hayes is lovely as Catherine, a British nurse with whom Frederic (Cooper) falls in love while serving on the brutal Italian front. Hemingway's indictment of war and tale of bittersweet romance emerges as a powerful and moving film that remains not only a literary classic but a true film classic as well. 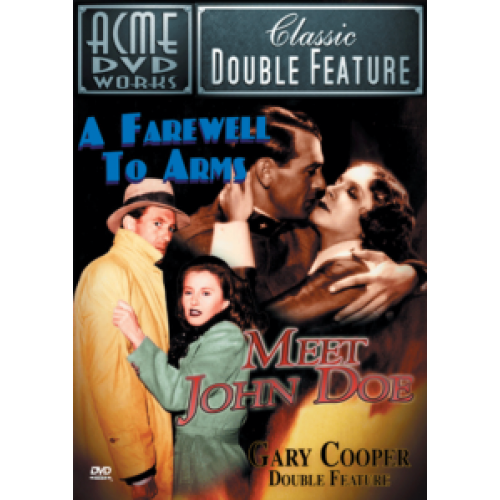 The second feature, MEET JOHN DOE, is director Frank Capra's classic ode to the common man. This social commentary/comedy/drama stars Cooper as one of the millions of unemployed workers, only he's been hand-picked to represent the ‘typical American', John Doe, by a newspaper publisher. Cooper is soon built into the symbol of the average man by the high-pressure campaign of the news tycoon with the help of an attractive reporter (Stanwyck). But Cooper finds that he's being used to further the publisher's power-seeking political ambitions and rebels. What happens then makes for one of the truly engrossing conclusions to any of Capra's masterpieces.